For crisp, crystal clear prints it is hard to beat the HP 1215. Sooner or later your HP 1215 will polish off its printer ink, and when it finally does happen you'll notice that buying HP 1215 ink is generally really costly. But you don't have to waste time worrying about forking out the steep asking prices you'll discover on the main street because right here at Cartridge Save you can order all the HP 1215 cartridges you will need at very competitive prices. Start to save money on your ink by shopping online at Cartridge Save! Why waste money to buy the 1215 original cartridge or 1215 compatible ink in the high street when it is much more simple to save a load of cash ordering online with Cartridge Save. You get utter satisfaction when purchasing PhotoSmart 1215 ink cartridges from us seeing as everything is underwritten by a no quibbles money back guarantee. Take into consideration that each and every order has free delivery, mostly arriving at your doorstep on the next working day! The reliable HP Photosmart 1215 s built to last for many years and delivers vibrant photos. This easy-to-use printer produces excellent graphics and text prints. It has a monthly duty cycle of 5,000 pages and a tray capacity of 120 sheets. However, the HP Photosmart 1215 cannot function at optimum efficiency when a non-HP photo paper is used for photo printing. The compact and sleek HP Photosmart 1215 features a paper tray, an easy to use control panel, and memory card readers for direct printing. An optional duplexer is available. It supports parallel, USB, and infrared connectivity. Get high-quality photos again and again with the HP Photosmart 1215. Unlike newer models that are quite flimsy, the HP Photosmart 1215 is built to last a long time; its age will not compromise the quality of its prints. It is also more affordable compared to similar models and boasts a large capacity ink. Memory card readers are available, so there is no need to transfer files to a computer first before printing. 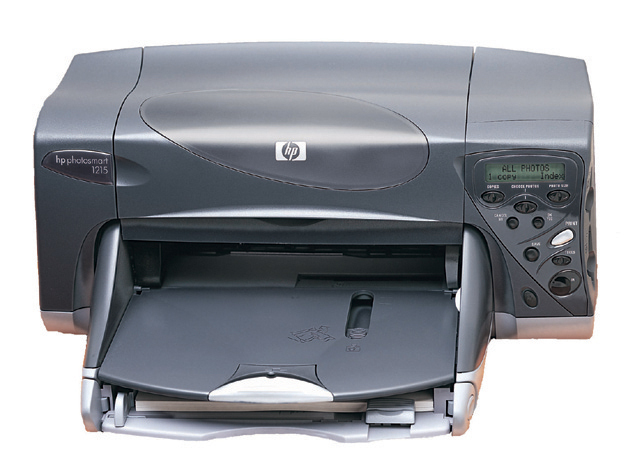 When printing photos, the HP Photosmart 1215 is rather picky with the type of paper. Be sure to use only HP photo paper, or the pictures won't come out looking vibrant. Worse, you might run into paper feed and jamming problems.